We offer over 40 currency pairs, shares, crypto, and cfds for your personal investment and trading options. I started using Global Prime after being recommended by quite a number of FX veterans in SHF. I have tried using several brokers and big banks before, Global Prime is by far the best in service and their spreads are very good too. Jonas was my account manager and he was exceptional in his service. patient, prompt, friendly and very knowledgable. I have bothered him multiple times in account creation and other technical questions, he was very fast to reply, his replies were all accurate information and he has tonnes of patience attending to some weird technical questions I had. I highly recommend GP for all. I few days ago requested a withdrawal and today i received it, and i must say they are really responsible. Always been the best and always will be. 2 years of trading with GP and never had a single issue. The customer service is always awesome and very helpful, they answer very quickly! The pricing is good, there is no b booking or such (never had an issue where I thought that b booking would be happening!) - A true ECN broker. In addition to my review from 20MAR2019, I would like to mention by name Chi-Rong Ho who is attending to the main support email. Most certainly one of the best, if not in fact THE best support experience that I can ever recall: I do not think I have ever seen such speedy replies, the responses are not only re-active to my inquiries but also pro-active to prevent future problems, and the level of professionalism is always top notch. Excellent going Chi-Rong! Mar 20, 2019 - 5 StarsI have been with Global Prime since around July 2018, and since that time have carefully looked for anything to complain about, which I am very happy to report I have NOT found at all! 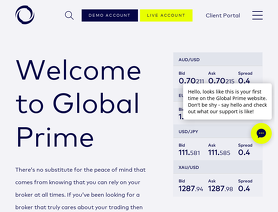 From the onboarding process, to deposit and withdrawal, to support and assistance, timeliness and accuracy of statements and communications, spreads, execution, and the handling of the AUD / JPY flash crash at the beginning of the year - Global Prime has not only met but exceeded all expectations! I wish leverage was higher but it is very easy to understand if more than 1: 200 is needed than this is most likely over-trading anyway. I also wish to swaps were lower than when I tried to compare to other well-known brokers all I saw were MUCH worse rates. Very happy client here and I hope to continue this relationship for years to come. . .
Wow, what a review! Made our day. Likewise, we look forward to working with you over the years. If there is anything at all we can help you please let us know. Wishing you well with your trading. I just had some great help with Levi, I was very pleased and I recommend this broker especially if your in Australia, but also around the world. Just so glad to have something safe and honest close to home. Fast and great responsive service any time I have questions! Spreads are always very tight. They are always improving their products and I'm sure their service will not change. Can not go wrong with them! i have had superb customer service so far from getting my debit/credit card approved to any other questions that i have had before choosing this broker. The spreads are great as well and i can truly say i trust this broker with my trading/funds. Today I opened up an account with Global Prime, and I can tell you I was blown away by the service they delivered from beginning to end. I have heard many stories from friends regarding their trials and tribulations that they have had opening accounts with other brokers and thought I might end with the same type of experience. I truly was expecting the whole process could possibly take me a couple of days of back and forth, missing documents, take a clearer picture, need a copy of a household bill, etc, etc, etc. The whole process to submit the application and fund my account took a little over 1 hour. Can I say I was really impressed with that experience. I then was not sure what to do in regards to opening up a Meta Trader account and had to contact customer service. I ended up dealing with an amazing consultant by the name of Levi, who went above and beyond walking me through the steps to set up the account on my android phone, and stayed with me until the account was up and running on my phone. If this is an indication of the type of service that I will be getting from Global Prime, they will have a customer for life. Once again superior service by a great company. Excellent spreads and trading conditions, excellent customer service. Jeremy Kinstlinger has always been greatly accommodating as has the staff in general. I highly recommend this broker. Thanks for the recommendation. It's been great working with you over many years. Always happy to help you out! very happy so far with GP.. Thanks for the awesome review and great to have you on board. Please get in touch with your questions and concerns via email and we can go through this together with you.